Just what you need on the go. Coming to the App Store end of 2016. Repairs common problems when importing CAD files such as incorrect trim orientation or missing topology. Uses the Metal render API for great render performance on iOS devices. Comes with a selection of environments that instantly make your model look that much better. Supports image-based lighting. Single finger to rotate, two fingers to zoom, double-tap to fly to. It’s that simple. Automatically loads referenced part files and hides them in the main gallery for a better overview. Camera definitions and meta information such as Z-is-up or model units are correctly imported to make it as quick as possible to put your model in one of our surroundings. 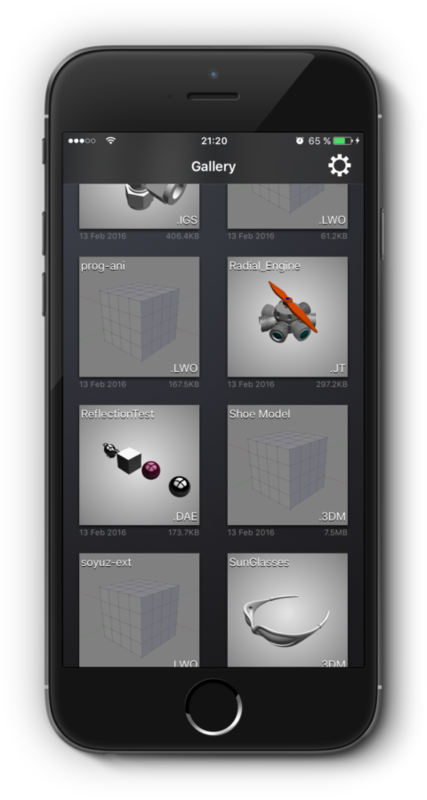 Shapeflow 3D is a mobile CAD viewer for the modern age and your Swiss army knife for everything 3D. It is build on top of our proprietary Core SDK and based on the same, powerful algorithms as our desktop apps. However, everything is wrapped in a modern, touch-based interface to make everything “just work” and look beautiful. Get your model in, make it look great and render out a high quality image, all from your mobile device. Feel free to contact us if you are interested in this product and have a specific requirement, use case or general questions. The following is a selection of the most frequently asked questions we get.